Hyper headphones deliver bright, lively sound with looks to match. Durable but lightweight, the closed back design allows for smooth natural bass, crisp highs and high sensitivity, making them ideal for use in noisy environments, The rotating ear cups can be flipped and folded for compact storage - perfect for travelling and everyday use. 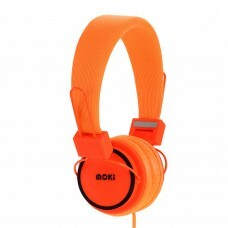 ACC-HPHYP - UPC: 9328854006339Hyper headphones deliver bright, lively sound with looks to match. Dur..
ACC-HPHYGHyper headphones deliver bright, lively sound with looks to match. Durable but lightweight,..
ACC-HPHYBBoys and girls will just love the bright, vibrant colours of these Hyper headphones f.. Newest range from Moki. Lil' Kids Headphones are both colourful and practical. These headphones have..